One side effect of the dissolution of the USSR was the opening of the Iron Curtain to railroad enthusiasts. 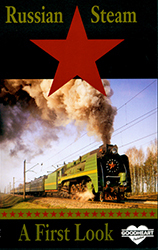 In fact, the various new republics beckoned railfans by providing steam-powered special trains using locomotives retrieved from the strategic reserve. Goodheart Productions made a number of trips to the former USSR to bring back this eye-opening look at the wonderful variety of broad-gauge locomotives that not too many years ago were cloaked in secrecy. The locomotives seen here include the beautiful "P36" 4-8-4 with tall drivers, a skyline casing and a very colorful paint scheme. You'll also see a German Kriegslok 2-10-0 wartime mass production locomotive and an ER class 0-10-0, which is probably the most numerous class of locomotives ever built anywhere in the world, with over 10,000 manufactured. The Russian Su-class 2-6-2, which was the USSR's standard passenger power for many years, makes a solid presence. Various regular electric and other passenger and freight trains and station scenes add to the interest. Shot in various weather conditions mostly in the winter.